Do you love Bruce Springsteen? B.B. King? Garth Brooks? Ruben Blades? No doubt you answered yes to at least one of those, but it’s quite likely you do not know the name of the visionary record-industry mogul who set the stage for those artists to succeed ― and perhaps even to exist at all. 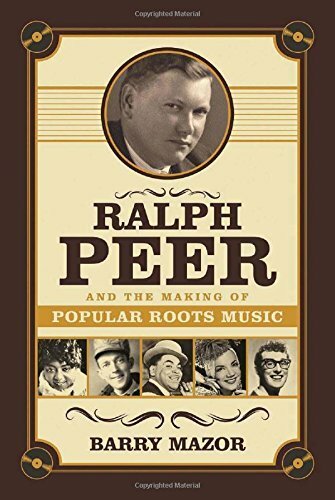 That would be Ralph Peer, the Kansas City “A & R man” (artists and repertoire) who in the 1920s virtually invented country and western ― then called “hillbilly” ― music, not to mention kicking off the blues craze, documenting early jazz and introducing North Americans to the rumba. Music-industry insiders will already be familiar with Peer’s 1927 “Bristol Sessions,” which brought us the Carter Family and Jimmie Rodgers, foundational pillars of country music. But Barry Mazor’s new biography provides a social, historical and economic context for Peer’s accomplishments, as well as an examination of the broader vision that informed his work, both of which should interest general readers. A quiet, introspective, ambitious lad born in Independence, Mo., in 1892, Peer grew up working in his father’s sewing-machine store, which also sold newfangled “talking machines” (record players) and 78-RPM records. By the time he was 11, Peer was picking up new releases from the Kansas City regional office of Columbia Phonograph, where he was hired as a clerk after high school. In those days, high culture figures such as the opera singer Enrico Caruso were getting recorded, but seminal jazz, blues and “old-time music” players were overlooked. Seeing this as an opportunity, Peer set about making records by artists from rural or “underserved” urban communities ― black sharecroppers, white farmers recently relocated to the city ― then selling the recordings back to their own people. This made Peer a millionaire, many times over. Starting in 1919 with the Okeh label, which in 1920 ignited the blues mania with “Crazy Blues,” by Mamie Smith, Peer recorded (or published) a staggering list of artists that includes, in addition to Rodgers and the Carters, everyone from Jelly Roll Morton and Louis Armstrong to Jimmie Davis (“You Are My Sunshine”), Kitty Wells (“It Wasn’t God Who Made Honky Tonk Angels”) and Consuelo Velazquez (“Besame Mucho”). But Peer’s prescient ability to pick hits wasn’t the only talent that made him rich. He signed artists who wrote their own material, taking a percentage of their publishing royalties, eventually creating a worldwide empire through his company, Southern Music. Mazor does a good job telling Peer’s story, making a point of differentiating his subject from someone like Alan Lomax, who was also documenting the music of “the people,” but for academic (and populist) reasons, not commercial ones. That said, the first half of this biography reads far more swiftly than the second, which bogs down in the kind of industry details one finds in Billboard magazine. And while Mazor seems to have mined what’s out there about Peer’s three marriages and his avid hobby of collecting camellias, the man remains a bit of a cipher. Unlike the stars he recorded, you can picture him, but you can’t quite hear him.